On May 7th, 1995 Michael Jordan stepped onto the hardwood for Game 1 of the Eastern Conference semifinals between the Chicago Bulls and Orlando Magic. All eyes in the stadium and across the country from the people watching on tv were locked in on Jordan, not because of a highlight play, but because of the shoes he had on. Nearly two months had passed since Jordan ended his 17-month retirement. When he returned, he shocked the basketball universe by switching to No. 45, not the No. 23 he’d previously worn for his entire NBA career. The new number was what he rocked for the Birmingham Barons playing in baseball’s minor leagues. All the other players on the court were donning the traditional playoff look of all black sneakers but MJ was showing off the fresh, predominantly white ‘Concord’ Air Jordan 11s. The No. 45 was there as well, printed in white on the heels of each shoe to match the jersey he had on. From there the rest is history. From that moment, sneaker lovers, Michael Jordan historians, and fans of the game have looked at the ‘Concord’ Air Jordan 11 differently. The shoe has been described as “absolute perfection in a sneaker”, “the holy grail” and much more because of its White, ballistic mesh upper and a shiny, elegant Black patent leather wrap that was unlike anything that’d ever been seen on a sneaker. Then when good friend of Michael Jordan, Ahmad Rashad, decided to do a small feature on the patent leather shoes during the nationally broadcasted game, it sent the newly-forming sneaker community into a frenzy. There haven’t been too many moments like that since. Outside June 14th, 1998 (if you don’t know what happened that date, then do some searching), I can’t think of any athlete truly shocking the world with an unknown sneaker. Since the debut in 1995, the ‘Concord’ Jordan 11 has released twice in 2000 and 2011. This years release is unlike the previous ones, as Jordan Brand goes back to ’95 with this version. These are as OG as it can get with a pair of Jordans. Swapping out the 23 on the heel for 45 like MJ’s pair, all the shoe’s iconic details are featured, from the striking Black patent leather mudguard to the White mesh upper. Finally, the colorway is topped off with a translucent outsole that’s rounded out by subtle Concord Purple hits on the tongue and bottom. 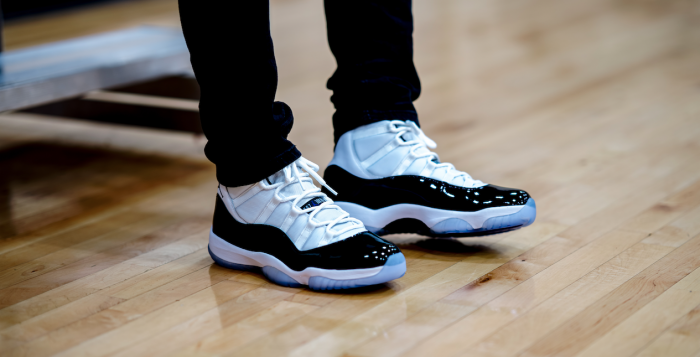 Grab your pair of the Air Jordan Retro 11 ‘Concord’ on December 8th at Finishline.com. Make sure you check with your local store for more release details. Enter your name in the raffle to reserve your pair! Reservations Close on Monday Morning on December 3rd. The Air Jordan 11 holds a special place in the sneaker realm for what Jordan did wearing the shoe and the one of a kind look that they had when he debuted them on May 7th, 1995 in a game against the Orlando Magic. 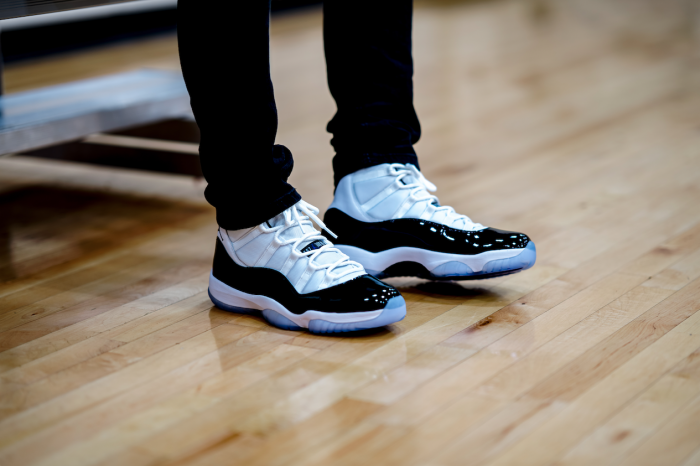 As the years have come and gone, the love and demand for the Retro 11 has become bigger than anything Tinker Hatfield or Michael Jordan could have imagined. Now, Jordan Brand is honoring those who accomplish graduating high-school with this premium take on the ’96 classic hoops model that is perfect for formal events that fall near the end of the school year in mind. JB is also giving graduates first dibs through a special SNKRs release that has never been done before. 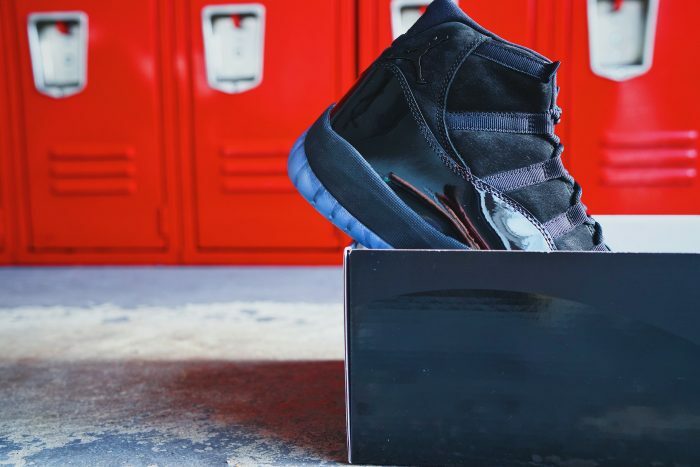 What started as a sample in the ‘Blackout’ Collection back in 2011 has finally come full circle to be released after sneakerheads have been begging for years. 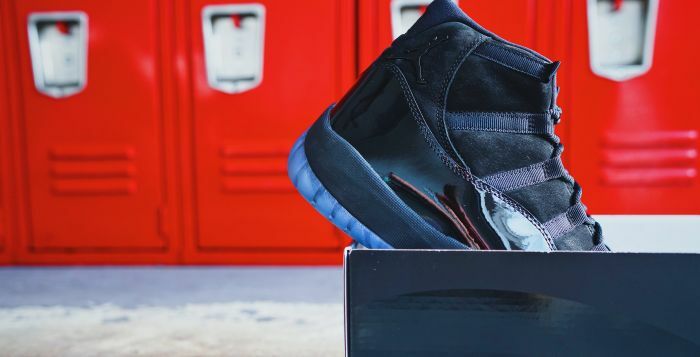 Since 2011, this pair has accumulated numerous nicknames like ‘Blackout’, ‘Prom Night’ and others but Jordan Brand has dubbed these ‘Cap and Gown’ 11s. The all-black pair sports suede panels in place of the usual ballistic mesh, tonal branding hits, a metal Jumpman on the lateral heel in place of the usual stitched interpretation, a smokey outsole, and the model’s signature high-cut patent leather. To add to this pair’s theme, the black laces are made to resemble the cords worn by students on graduation day. Thanks to its shiny patent leather detailing resembling a dress shoe, the 11 has been re-purposed over the years by some as an “acceptable” compliment to formal wear. With college graduation season already underway, don’t be surprised to see certain students rocking these with their traditional attire when they receive their diplomas this year. This pair will be releasing in MEN’S SIZES ONLY. 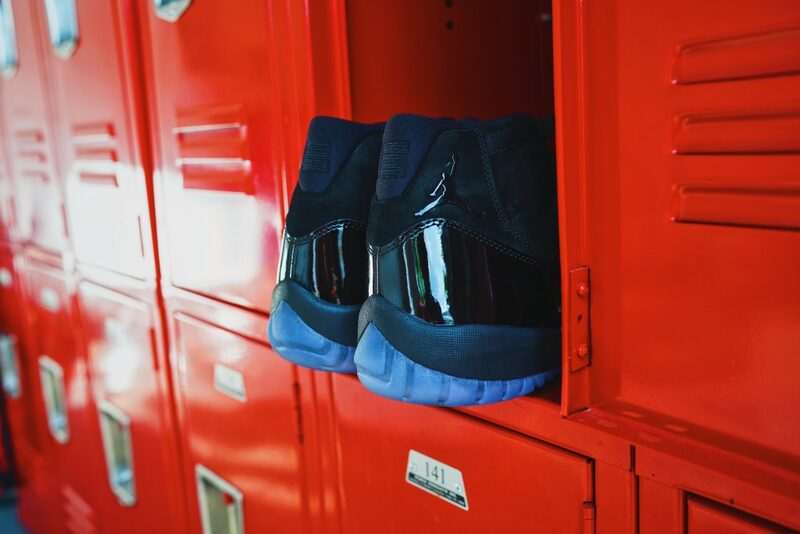 Grab your pair of the Air Jordan Retro 11 ‘Cap and Gown ’ on May 26th at Finishline.com. 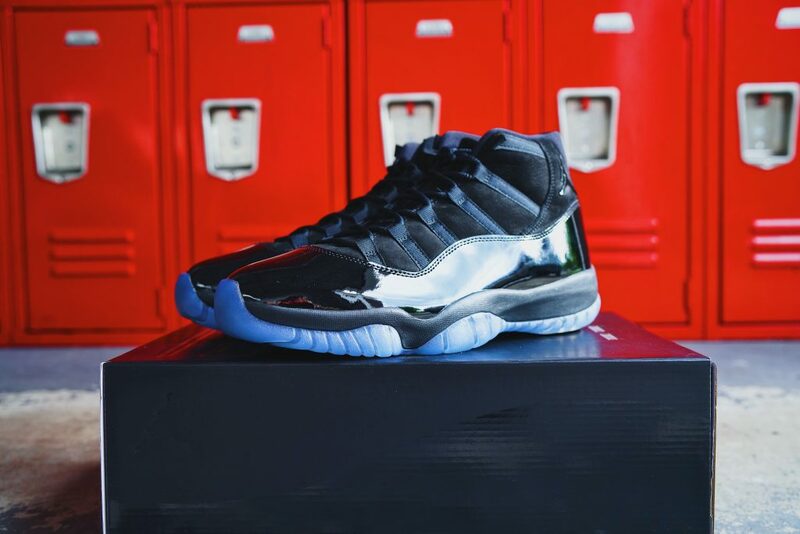 Make sure you check with your local store for more release details.